​The Prince Edward County Jazz Festival is excited to announce the expansion of their youth education programs with the creation of the Prince Edward County Jazz Festival Youth Ensemble (PECJYE). ​The PECYJE will provide outstanding high school musicians the opportunity to further develop their musicianship through rehearsing and performing in a small jazz ensemble. ​For more information and audition requirements, visit our Youth Ensemble page. Louis Armstrong learned a lot about jammin’ when Joe King Oliver took him under his wing. There were no trumpet parts in Oliver’s band for Armstrong to read, and so he had to listen and just make it up. Miles Davis was mentored by the legendary Clark Terry while he was still in high school. So if you’re an aspiring high school jazz pianist in modern-day Ontario, imagine going one-on-one with a two-time JUNO winner. Or saxophone sessions with a guy who backed Tony Bennett and Herbie Hancock. Or trombone talk with a two-time nominee as Canada’s best…or drum discussion with one of the country’s most-recorded musicians. That’s just the plan for nearly eighty central and eastern Ontario high school musicians who will take part in The TD Jazz Education Program in Prince Edward County April 21-23. It’s a crucial part of the Prince Edward County Jazz Festival’s commitment to the future of jazz. The young musicians will gather at the Isaiah Tubbs Resort for three days to soak up all the performance help and jazz knowledge their master mentors can offer. And at the end, on Sunday April 23, they show what they’ve learned, and actually perform with the pros. The high school ensembles will share the Regent Theatre stage in Picton with the Brian Barlow Big Band and 2017 JUNO-nominated vocalist Barbra Lica. Show time is 2:30 p.m. Sun. April 23. “This thing is now a fixture in Canadian jazz education,” says program director Blair Yarranton. However, Prince Edward County Jazz Festival Creative Director Brian Barlow points out that only a few will become professional musicians. The Prince Edward County Jazz Festival is pleased to announce that the recipient of our 2016 Rising Young Star Award is twenty-one year old Hannah Barstow from Napanee, ON. Hannah is a pianist, composer and vocalist who recently graduated from the University of Toronto where she earned a Bachelor of Music in Jazz Performance with honours. While at U of T Hannah received a number of awards, including the Oscar Peterson Grant for Jazz Performance and the U of T Jazz Arranging Prize. Hannah participated in the TD Jazz Education Program while attending high school in Napanee, and has been a regular performer at the PEC Jazz Festival since the age of thirteen. The Rising Young Star Award is generously sponsored by Hillier House. Direct from wins at the 2016 JUNO Awards - the Prince Edward County Jazz Festival will present vocalist Emilie-Claire Barlow and pianist Robi Botos at this year’s festival, which runs Aug. 16 - 21. 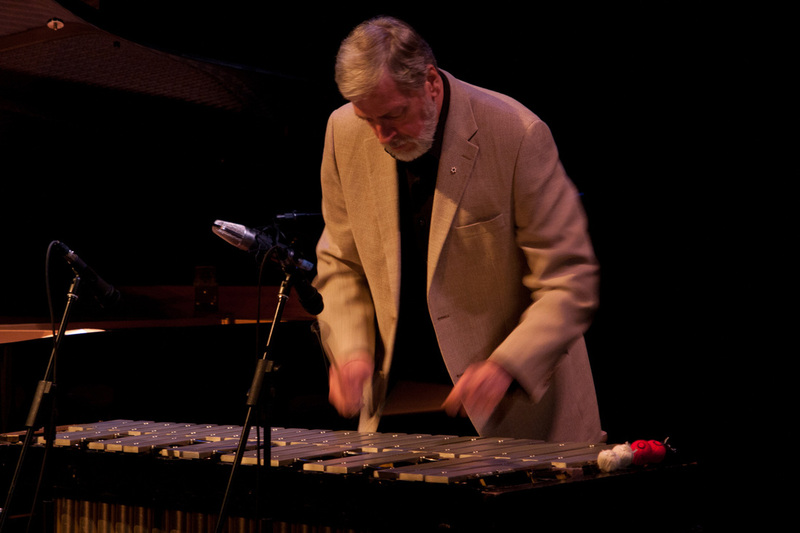 The two stars captured two of three available jazz JUNOs this year; Barlow won and earned another nomination for best vocal jazz album for Clear Day and Botos’ Movin’ Forward captured the prize for solo jazz album. In fact, the entire 2016 Prince Edward County Festival lineup is steeped in JUNO, Gemini and even Grammy winners and nominees: Joe Sealy, Jackie Richardson, Mike Murley, Guido Basso, Bernie Senensky, Brian Barlow, among others. Performers include rising young talents such as bassist Jodi Proznick, tenor saxophonist Alison Young, vocalist Alex Samaras, and a week’s worth of TD Young Jazz Series artists who will one day make their mark as headliners. Since 2001, the Prince Edward County Jazz Festival has been presenting the very best in live Canadian and international jazz for a week in August. That’s five straight days for fifteen consecutive years, a record that clearly establishes the Festival as the number-one producer of world-class live entertainment in a part of Ontario becoming well-known not only for its wine, but also for its creative contributions to Canadian culture. Performers are getting younger. With an average age under 40, and a week’s worth of shows by emerging artists in the TD Young Jazz Series, the music is alive, well, hip, and going places. 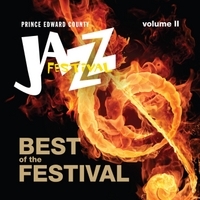 Prince Edward County Jazz Festival - Aug. 11 - 16 - Fifteen Years in ’15! Miles Davis' "Kind of Blue"
Brian Barlow Big Band - "The Best of the Best"
The little festival that has grown into one of Canada’s most respected celebrations of jazz is fifteen years old this summer. Today, we announce a 2015 lineup of main-stage shows featuring an array of A-list artists pouring out a wide range of jazz that live music-lovers will simply not want to miss. We are proud to announce that three of the last five winners of the “Rising Young Star” award…Marika Galea, Ian Wright and Eli Bennett…will perform in main-stage shows. Marika and Ian are also graduates of the Festival’s TD Jazz Education Program. As usual, the festival will showcase some of the world’s best musicians from Toronto, Montreal, Vancouver, and south of the border. Festival-goers can also savour great jazz, great food, and great wine at many of the 30 satellite venues nestled throughout the “County” all week long. PEC Jazz Festival sponsors at the 2015 Media Day event: (from left to right) Christopher and Norah Rogers, The Waring House; Scott Wentworth, Scott Wentworth Landscaping Group Ltd.; Elizabeth Crombie, Royal LePage ProAlliance Realty; Peter and Celia Sage, Sage Design & Construction; Brian Barlow, Creative Director, PEC Jazz Festival; Catharine Huff, Huff Estates; Ken and Janet Harnden, Pinnacle Music Studios and Yamaha Piano Dealership. The Prince Edward County Jazz Festival is pleased to announce that the recipient of the 2014 Rising Young Star Award is 21-year old Marika Galea from Toronto. Marika is currently a full scholarship student at Berklee College of Music in Boston, working towards a Bachelor of Music in performance and classical composition. She currently studies with bassist John Lockwood and has worked with other prestigious faculty, including John Patitucci. She has already performed with a number of highly acclaimed artists including Cyrus Chestnut, Bucky Pizzarelli, and Benny Green. Marika first performed in the County in 2011 at our TD Jazz Education Program as a member of the Agincourt Collegiate Institute jazz ensemble. See our Rising Young Star page for more information on this award, generously sponsored by Hillier House. Thanks to everyone involved for helping to make the 2013 Prince Edward County Jazz Festival such a success. Check out the photos below for a small sampling of this year's festival events. More to come! Best of the Festival, Volume II now available for download! Our new album features a collection of performances recorded at the Regent Theatre in Picton, Ontario from 2006 to 2011, and includes some of Canada's top jazz artists. "The conditions were perfect in Prince Edward County last weekend for enjoying wine, the beach, and jazz." The lineup for the 2013 Prince Edward County Jazz Festival was announced on May 10 at a Media Day event at Huff Estates Winery. The Prince Edward County Jazz Festival is pleased to announce that the recipient of the 2013 Rising Young Star Award is 21-year-old Matthew Woroshyl of Mississauga, Ontario. Matthew has just completed his studies in Jazz Performance at the University of Toronto and has been accepted at the prestigious Manhattan School of Music in New York. Thanks to everyone involved for making the 2012 Prince Edward County Jazz Festival such a success. Check out the great photos below. Members of the Louis Hayes Cannonball Legacy Band with 2012 Rising Young Star Claire Devlin. 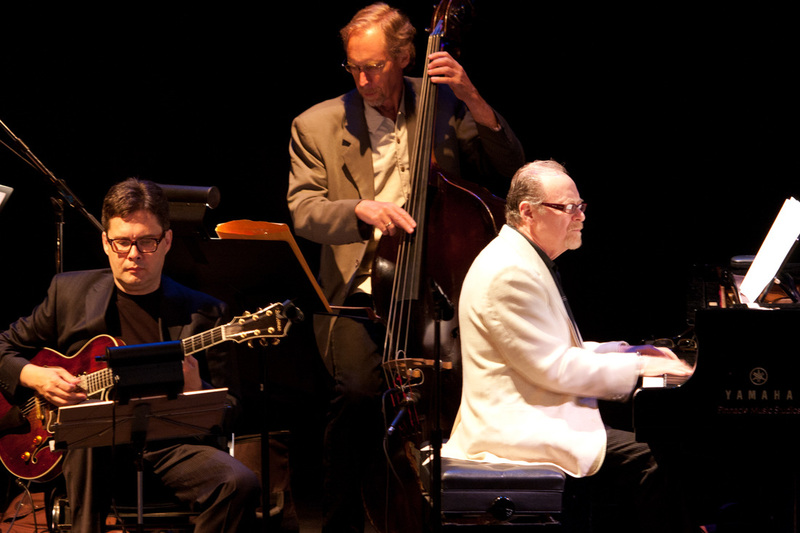 Tribute to George Shearing at the Regent Theatre - August 18/12. Great jazz at Huff Estates Winery - August 18/12. Mike Francis (guitar), Neil Davis (bass). The Chameleon Jazz Band with Jamie MacPherson (banjo). The lineup for the 2012 Prince Edward County Jazz Festival was announced on May 11 at a Media Day event at Huff Estates Winery. The 2012 TD Canada Trust Jazz Education Program was a great success. See below for photos from the April 14th concert, which featured the Brian Barlow Big Band with guest vocalist Barbra Lica and students from the participating high school jazz ensembles. The Brian Barlow Big Band. 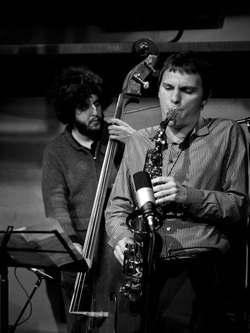 Back row, from left to right: Charlie Gray, Jason Logue, Blair Yarranton. Middle row: Michele Gagnon, Kelsley Grant, Russ Little, Doug Gibson. Front row: Perry White, Colleen Allen, John Johnson, Michael Stuart, Bob Leonard. Not pictured: Scott Alexander, Robi Botos, Brian Barlow.